What he had seen was the most massive solar flare over the last 500 years. Fortunately for the people of 1859 electrical equipment was not common nor as finely engineered & thus subject to electromagnetic pulse (EMP) damage as nowadays. Today miles of wires are common & all our machines are much more sensitive. There has been no flare anywhere close to matching this but a "huge solar flare on August 4, 1972, knocked out long-distance telephone communication across Illinois. That event, in fact, caused AT&T to redesign its power system for transatlantic cables. A similar flare on March 13, 1989, provoked geomagnetic storms that disrupted electric power transmission from the Hydro Québec generating station in Canada, blacking out most of the province and plunging 6 million people into darkness for 9 hours; aurora-induced power surges even melted power transformers in New Jersey. 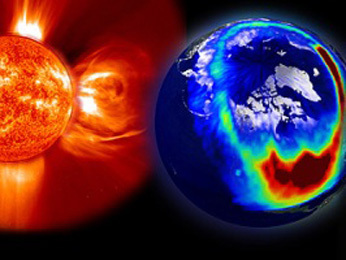 In December 2005, X-rays from another solar storm disrupted satellite-to-ground communications and Global Positioning System (GPS) navigation signals for about 10 minutes"
it is clear that a repeat of the Carrington event could produce a catastrophe the likes of which the world has never seen. "It's just the opposite of how we usually think of natural disasters," says John Kappenman, a power industry analyst with the Metatech Corporation of Goleta, California, and an advisor to the NAS committee that produced the report. "Usually the less developed regions of the world are most vulnerable, not the highly sophisticated technological regions." Europe's electricity grids, on the other hand, are highly interconnected and extremely vulnerable to cascading failures. "The good news is that, given enough warning, the utility companies can take precautions, such as adjusting voltages and loads, and restricting transfers of energy so that sudden spikes in current don't cause cascade failures. There is still more bad news, however. Our early warning system is becoming more unreliable by the day." Transmission systems might also work less efficiently if more breakers were in place. In the same way banking works more efficiently if banks don't have to keep large reserves - right up until things go wrong. If we update infrastructure over the next 10-15 years as part of routine maintenance it should be possible to protect systems at a reasonable cost. The risk is not that nothing can be done but that since we have no experience of this, governments will simply ignore it, as indeed they have up to now. Unlike Y2K there isn't a deadline to stimulate thought, however it is clearly a much more real problem than that & a more imminent problem than catastrophic warming. I also think more real but certainly more imminent is unarguable. This is not the sort of scare that can be easily visualised by Luddites which is the problem. If we update infrastructure over the next 10-15 years as part of routine maintenance it should be possible to protect systems at a reasonable cost. I can't see it happening. Most private power companies here in the States have thin margins if I remember correctly. This shows in the constant transformer fires that seem to occur regularly here in America. High tax areas like NJ and decaying areas like Michigan seem to have it the worst. Texas hasn't ever been affected by a major statewide blackout that I know of. Lastly, here in America PCBs were banned a few years ago as a threat to drinking water supplies. PCBs were used as a fire retardant in the oil bath in transformers. Transformers without this fire retardant are more likely to burst into flames, and do, which is another explanation for the more frequent large transformer fires. What I wrote above just proves that people who vote Democratic will eventually have a lower standard of living, if not actual poverty. And yet some seem to never learn. Another example of how regulations to protect the "environment" are bound to have "unforeseen" costs. A higher standard of living is the necessary first step to making us & our environment safer. State regulators could demand that such safety ,easures be done & as I say they would be affordable id fone as part of routine maintenance but they would then have to lighten up on price controls. Of course a competently regulated nuclear would be far cheaper anyway. Here in America the feds mandated that all of the states go to an open model where the local power company is just a carrier for electricity not a unified provider. This caused the California electricity crisis. Prior to Washington trying to use force to bring about competition the states, even the socialist ones, had functioning power grids. The socialist clowns in California may be wrong on economics and race, but they live in California so they can manage a state regulated business better. The one state where this type of forced competition works is Texas, which has its own independent power grid. I personally would have liked for the feds to scrap the Federal Power Board and its current succesor, not force a breakup for better competition. The states can enact price controls if they wish. The other cause of the California electricity crisis was the undercount of the number of illegals in the state, and therefore the underestimation of the number of future customers when drawing up capital plans. Second Cali imports its power due to oppressive state regs that prevent new power plants from being built. As a result I pay about $0.11/kWh and the residents of Cali pay $0.15/kWh. Texas pays the same as Cali. I think less central government & more state decision making would allow the US to experiment in what works. This is the advantage of federations. The 9th & 10th amendments to the US constitution were supposed to limit the powers of Washington but do not seem to be applied. CMEs happen, and will blow things up regardless of whether they are in Republican or Democratic areas. Unfortunately, Katrina has made a "hero" of little Bobby Jindal. Let's hope that the next CME doesn't hit Alaska the hardest and make a hero of Smarmy Sarah. I think if a hurricane, or more likely volcano or earthquake hit Alaska the MSM would be explaining why it was her fault & why, as a woman, she was particularly ill equipped to handle it. But if a liberal woman governor were to have a volcano go off in her state it would not be used against her.